I have to admit I was feeling a little star struck. 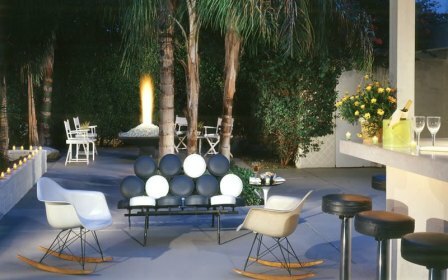 One minute I was standing next to this fabulous Albert Frey designed mid century modern wing of the Movie Colony Hotel and the next, I’m finding out it had real celebrity history. This is the thing about Palm Springs; wherever you go you get a story. Don’t get me wrong, I’m not saying for one minute it’s fictional, far from it. This desert city has been home to movie stars and celebrities since the 50’s and the folk here are not short of a personal tale or two, particularly when it comes to Sinatra and his Rat Pack pals who had a whale of a time frequenting just about every bar here. In my particular case, it seems legendary Doors singer Jim Morrison jumped from the roof of this very building directly into the adjacent pool. “In those days” points out General Manager John, “there was no railing just a flat roof and Jim just went and jumped straight off into the pool”. Mr. Morrison wasn’t the only person of note to have frequented this particular room either, as a certain Mr. Frank Sinatra also stayed here while his house was being built a little further down the street. Oh my. Over the years the glamour faded and the property went into decline only to be reborn as a smart privately owned boutique property where the emphasis is clearly on low key understated chic. The owners have restored Frey’s 1935 structure to its former glory, and added extensions that retain the look and feel of his original design. There’s a rather lovely fire pit that’s perfect for a cosy get together after dark when the free wine and cocktails come out between 5 and 8pm. After which you’re free to come to the bar and take your own French pressed coffee and pick of luxury teas back to your town house or room. Talking of which were refreshingly airy albeit a little on the flimsy side. I could clearly hear next door’s TV through the paper thin walls, always a drawback of design over substance. That said, the interiors were elegant with stupendously comfortable king size beds, flat screen TV’s and pleasingly, free wifi, a welcome change from the often overpriced tactic many other hotels employ. My room even had a small patio area at the back with a lounger and table and chair to pass away a relaxing afternoon away from the sun. 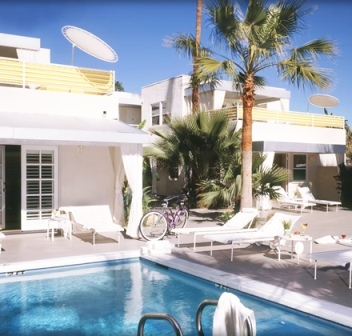 The hotel is in the fashionable Pal Springs Movie Colony neighbourhood, so called because of the numerous local celebrities who were drawn to live here and it’s just a ten minute walk from down town. The hotel will even give you a free bike to use if you don’t feel like walking. There’s no restaurant, although a light breakfast of fresh croissant and fruit is included in the room price. However right next door you’ll find the El Mirasol restaurant serving truly exceptional Mexican fare, (I still dream about the guacamole dip). 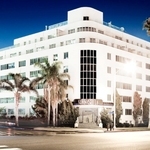 What does it cost to stay at The Movie Colony Hotel? Rates from £140 per night for a poolside patio room.